RosterWatch Nation, the time has come to once again dominate your fantasy drafts. The original epic three-step cheat sheet is now available for download to RosterWatch PRO members. Most of you have used the Cheat Sheet in previous seasons and you know it’s the simplest, most effective and most easy-to-use fantasy football draft tool on the market. The Cheat Sheet is a sheet of paper you print out, then mark off names as players go off the board. Last year, we added the online tool with functionality to be used in the same way — either on your computer or any mobile device you’d like. If you follow the three simple rules (even a toddler would have no problem understanding them), you are, as always, GUARANTEED and expert-quality draft. Just don’t break the rules by bastardizing the sheet. 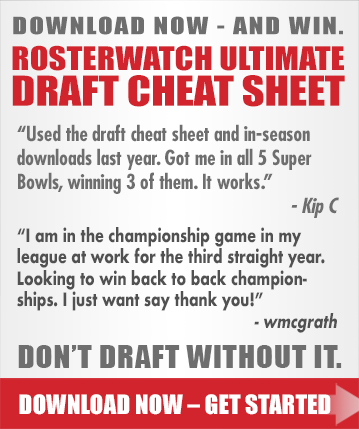 DOWNLOAD V.1.0 of the 2018 RosterWatch Ultimate Draft Cheat Sheet (STD/.5 PPR) – START HERE!!! We’d wish you good luck but you don’t need it. Don’t believe us? Just read the testimonials. ***The cheat sheet will be updated frequently through the NFL preseason. RosterWatch PRO users will have access to all cheat sheet updates, so PLEASE check to make sure you are using the most recently updated version before utilizing the tool in real drafts. Don’t have a RosterWatch PRO membership? Why not? Sign-up is simple and easy and it’s cheaper than a CHEAP cup of coffee. Sign up for RW PRO now! can you guys do a podcast or explain in your next podcast the reasoning behind using the standard cheatsheet for a .5ppr league. the meatheads on CBSSPORTS podcast just said people should use full ppr rankings when preparing for a .5ppr draft. obviously im listening to my rosterwatch peeps over those clowns. sure, although we think you can use the PPR cheat sheet in half-point PPR, I personally do. Guys, what I can add- from designing the Standard sheet to dominate both standard and .5 ppr – is that ADPs are very similar between the two formats, which should be the determining factor in choosing the sheet you utilize. I’m extraordinarily confident recommending the standard sheet for your .5 ppr drafts. I just analyzed my dynasty team vs the SOS Wr matrix, and I appear to have been handed a crap hand this year ! At what point do you divorce the stud from the SOS ? -Would you trade adams for JuJu + ? or am I going a little too maniacal ? BVIC – you HAVE to always divorce the talent from the matchups; the matchups are only to be used as food for thought as a tie breaker. With this said, I’m very interested in getting Keenan Allen – he’s the best player in that deal so I wouldn’t mind seeing you take it. It is all about how much faith you have in Foreman coming off of Achilles. I don’t know one RB that’s ever come back strong from that injury. With this said, I love D’Onta. I just worry. Thank you so much Juan. You’re the man! We appreciate your support tremendously. am I overlooking, or do you offer a cheat sheet for .5pt PPR? (based on other comments, the answer is NO). Furthermore, do you offer customization cheat sheets (I have alternative scoring rules, but mainly .5pt PPR). ie: .5pt PPR, but TE receives 1pt PPR. Our league scoring also receives splash points for TD’s of various lengths and players that gain 100yd+ or throw for 300yd+, but I do not draft or covet based on that…how can I? Let me know if you feel differently. Thx for clarifying SoS…divorce from the player/stud and use as a tiebreaker. Use the standard sheet for .5 ppr. If you want you can push the TEs up a tiny bit, give your scoring system. Your big play scoring would only be tie breaker for me between say somebody like Ty Hilton vs Doug Baldwin. I’d want Hilton in your system. Thank you so much for your loyal support. Cheers to a great season! Any thoughts on this mini DFS slate Thursday? Looks like they stole your champion idea. Figure I should test my luck. I’m doing some mock drafts with 10 team standard leagues and if i follow sheet to the “T” i end up with no QB,TE,DEF, or K. I’m open to this strategy as my league has 8 teams play in playoffs, so wins early on dont matter as much. Throwing around idea of taking L first week with huge roster of backups to trade away and stream those missing positions 2nd week.. Thoughts? Thanks Luke, see my answer to TClemen below for some more insight. I’d say in 10 team leagues I could care less about QB or TE or Def. 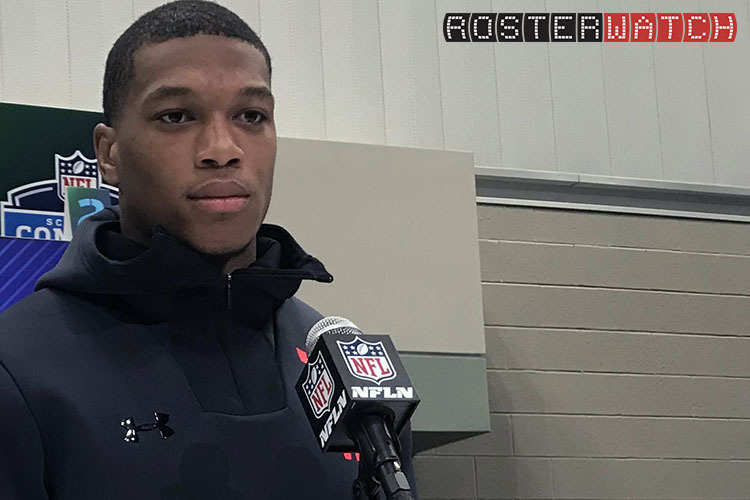 One thing to consider is to use their cheat sheet for the top 50 players in the draft..draw a line…fill out your best Qb and Te if its close. But their sheet fills you with awesome bench players for a game that is filled with injuries and wr and rb always gives more points. Just have to adjust and recognize pools of areas of talent. I like to see what rounds are acceptable according to the cheat sheet for taking a qb or te. Standard has you take them in fifth and sixth mainly. After that its the 12th through 20th for standard. In ppr its more in the 7-13 range. Every draft is different but especially in 10 team leagues I dont’ worry about QB,Def, or Kicker. And find out what Te you want and go for it sometimes. yeah i feel you on that. It’s just tough because i don’t know what size league they are tailoring the cheat sheet for. In a 10 team league, you likely wont end up with a QB or TE using the strict rules on the sheet. Sheet might need some guidance on what to do based on league size. This may seem like a stupid question but here goes. I am drafting 12th in a 14 team standard rules redraft. This is my first time using the cheat sheet. I did a couple of mocks last night, and both times-strictly following the cheat sheet rules- I ended up with 5 WRs with my 1st 5 picks. I’m guessing I’m doing it wrong. At what point do you recommend deviating for positional needs? That’s wild. If anything all the simulations we ran to test it were a tad bit RB heavy. The sheet is tested most vs 12 team drafts to kind of split the baby between 10,12,14 teamers. I’d be surprised if this happened in your real draft or in multiple mocks. Remember to never go too far of the reservation but to exercise some basic discretion. I’d say if that happened to me I would’t be worried until I took 3 wr in a row. Depenind on you risk tolerance, I’d say after you’ve taken 2 WR in RD1 and RD2 then make an executive decision to balance your roster as long as the next RB on the sheet is at least close to the next WR. Guys, also please remember it is very early and there is still a ton of variance among ADPs. Things will continue to come into focus over next few weeks. Why do you consider half point PPR the same as standard on the draft cheat sheet? Where did the best ball cheat sheet go? I have the 1st pick in a start-up Dynasty draft, full PPR. Anyhow, last year was my BEST Fantasy season by far! I was in the Championship in 7 of my 12 leagues!! Obv, the drafts were only part of that, but it was def the best I had ever drafted. If I were only going to subscribe to 1 site, it would be this one if only for that cheat sheet. Its incredible! I have Leveon Bell, Antonio Brown and Kareem Hunt. We have two keepers this year, which would replace picks 1.01 and 2.12. The question: do not overthink it and keep Bell and Brown. Or propose a trade to the Ezekiel Elliott owner offering Hunt and either Bell or Brown (Elliott is his only viable keeper). Theoretically, this would allow me to diversify my top two players. Is it the best play, though? Thoughts? Thanks in advance for any comments. Only week you might be worried about is their bye week, so you should take that into consideration in your draft. you’re giving up too much if you trade either and hunt for elliott.